Can't Sleep? Turn Off the Cell Phone! A good night's sleep is becoming ever more elusive for the average American  and it's a problem that plagues us at all ages, from infancy to adulthood. Now three new papers in the Sept. 1 issue of the journal Sleep tackle the question of sleeplessness: two studies illuminate the reasons why teens and adults don't sleep enough. With teens, a major culprit is cell phone use; with adults, it's work. Meanwhile, a third study of young children reveals that sleep deprivation in early life may lead to future behavioral and cognitive problems. The study in children was conducted at the Sleep Disorders Center at Sacre-Coeur Hospital in Montreal, where researchers analyzed the sleep patterns of close to 1,500 children aged 2.5 to 6 years  the first detailed study on the effects of sleep in developing children. The youngsters' mothers were asked to record the amount of time the children slept each night and fill out questionnaires about their child's hyperactivity and impulsivity, inattention and daytime sleepiness. Half of the kids slept 10 hours a night on average  the recommended amount for preschool-aged children  while 6% slumbered for less than 10 hours each night. Those short-sleeping children, says lead author Dr. Jacques Montplaisir, performed poorly on vocabulary and cognitive development tests at age 5, compared with the more rested group. In fact, the study found that getting one fewer hour of sleep a night during early development can triple a child's chance of scoring low on such tests, underlining sleep's long-lasting effects on proper language and cognitive development. Not surprisingly, the short-sleepers were also more likely to score higher on tests of hyperactivity and impulsivity at age six, highlighting the importance of consistent and sufficient sleep in promoting concentration and attention skills. Montplaisir's group found more hyperactivity even among youngsters who started out as short-sleepers but had normalized their sleeping patterns by preschool age, to 10 hours a night. That suggests that early childhood  before about 3.5 years of age  is a critical period during which parents should establish proper sleeping patterns, says Montplaisir, since lack of sleep during that stage can lead to detrimental effects on behavior and development later in life. These results are the only the latest in a growing body of evidence that links good sleep habits to better cognitive development in children. But they don't necessarily mean that light-sleeping children are doomed to wearing the dunce cap. Jodi Mindell, professor of psychology at Saint Joseph's University in Philadelphia, and an expert with the National Sleep Foundation, notes that Montplaisir's study doesn't establish a firm cause and effect between sleep and test performance. She notes that other factors can affect both how long children sleep and how they score on tests; youngsters with ADHD, for example, typically sleep less than other children and tend to score poorly on neuropsychological tests. "It could be that there are other variables here that could be impacting on both sleep and test performance," she says. Unfortunately, sleep remains elusive for many adolescents and adults as well, and two other studies in Sleep reveal that cell phones and our jobs may be to blame. In one study of more than 1,600 13-to-15-year-olds in Belgium, scientists at Katholieke University Leuven found that almost 60% of students used their cell phones either to talk or text message after turning their lights out at bedtime. After following the kids for one year, the researchers report that teens who used their cell phone more than once a week after lights-out were five times more likely than kids who never used cell phones at bedtime to say they felt tired one year later. The later the teens stayed awake with their phones, the more tired they were. Most teens concentrated their phone use around midnight, but some continued communicating well past 3 a.m. Among adults, sleep patterns aren't any better. Dr. Mathias Basner of the University of Pennsylvania plumbed a publicly available database of nearly 50,000 people questioned by the U.S. Census to find out exactly what short-sleepers  those who get four to five hours of sleep a night  did during waking hours. Since earlier surveys had linked less sleep with greater risk of disease and death, Basner was eager to tease apart whether it was the lack of sleep itself, or something else that the short-sleepers were doing while they were awake that was making them so unhealthy. He and his team were surprised to find that the main reason a person lost sleep at night was work. The more a person worked, the less he or she slept: compared with normal sleepers, people who slept 4.5 hours or less per night worked about 1.5 hours more per weekday and nearly two hours more on weekends. "The fact that work influences sleep time was not surprising, but we were amazed by the dominance of the work time effect," says Basner. "For every hour of sleep you lose, you work 30 minutes more." 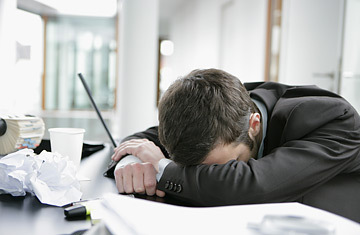 Previous surveys conducted over the past decade had found that for every hour of sleep lost, the average person worked seven to eight additional minutes, so these new results suggest a disturbing trend toward increased work-related sleeplessness. Basner notes that his findings in no way suggest a causal relationship between work and the amount of sleep a person gets (or, for that matter, between work and the higher risk of health problems associated with less sleep), but they do suggest that in future sleep studies, researchers should ask about how much time their subjects spend at work, and control for the influence that work may have on sleep. Understanding why we don't sleep could lead to better ways of helping us get more z's  anything but counting sheep.